In numerous applications, performance is highly dependent on the interface between the material and its surrounding environment. Many devices, ranging from biocompatible neural implants, antireflective optical coatings to antifouling sensors, rely on thin-film coatings to achieve the desired surface chemistry or functionality. While robust coatings are usually realized using inorganic components, more chemically tunable and flexible surfaces are easily accessible via polymeric films. On one hand we are investigating new materials via top-down approaches. In this pathway, the properties of preformed polymeric materials are spatially altered on a surface. This can occur via such methods as photo-crosslinking or light-induced solubility changes (e.g. in photoresists) to create new defined structures. Combinations with vertical gradients or stacked lamellar structures allow the introduction of another level of hierarchy. This can lead to interesting martials such as self-folding structures or photonic materials. 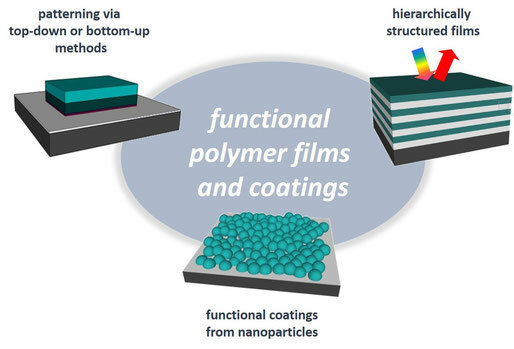 When polymeric nanoparticles or nanogels are used as building blocks for film formation, new processing methods are accessible that e.g. allow producing complex materials from aqueous media. On the other hand, we are interested in bottom-up approaches where the film architecture is controlled during the film formation. This can either be lateral or vertical and can be realized by such methods as layer-by-layer assembly of preformed polymers or the spatially confined growth of polymer brushes from functional surfaces.